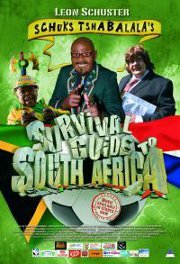 Leon Schuster is hoping to cash in on World Cup fever, his way. Schuks Tshabalala and his friend, Shorty, are commissioned by the 2010 tourism body to produce a movie as a visual guide and aid for foreigners coming to SA for the World Cup. With a diverse group of tourists to educate about the many weird and wonderful things about SA, they set up a series of gags to demonstrate what makes this country so unique. Parental Guidance (Language, Violence, Prejudice). We will get change at Nandos!